One of the most exciting new candies that I came across at the All Candy Expo was the new Reese’s Select Cluster, a bite-sized piece of sweet, peanut buttery goodness consisting of Reese’s peanut butter, caramel, peanuts, and pecans, all held together by a creamy layer of smooth milk chocolate. It was as if all of the candy stars aligned to make the perfect sweet for me – all of my favorite ingredients, held together by my favorite peanut butter in the whole world! Needless to say, I couldn’t wait to try one. The first thing I noticed about the clusters was that the dominating flavor is the familiar (and delicious) taste of Reese’s peanut butter. A generous dollop makes up the base of the cluster, which is exactly how it should be, for Reese’s instantly recognizable peanut butter, with its gritty and rich consistency, is the reason why people buy Reese’s products in the first place. I have to hand it to Reese’s – though they continue to spin off new and interesting Reese’s treats, they never forget or downplay the importance of Reese’s peanut butter as their star player. The clusters were a bit drier than I expected them to be – the caramel layer is pretty thin, which is a shame, really, as a thick, gooey, chewy layer would have added a nice bit of texture to the candy. The dryness of the center of the cluster is offset by the creamy texture of its milk chocolate coating. A smooth, rich layer of sweet milk chocolate, akin to that that coats Reese’s Peanut Butter Cups, locks the cluster in place. The nut pieces are fairly small, and because the peanut butter flavor is so overwhelming, the peanut and pecan flavors fade to the point of non-existence, leaving only their crunchy consistency to represent them. I would have liked a few more nuts in the cluster, again for textural reasons, but the crunch factor as it stands is fairly decent and provides a nice balance to the creaminess of the peanut butter center. 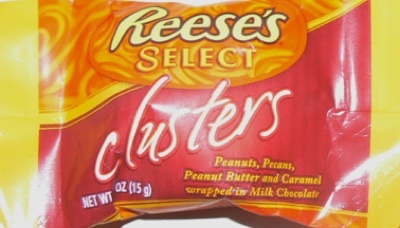 I am a huge Reese’s fan, so I enjoyed the Select Clusters quite a bit. However, if the choice between a Reese’s Select Cluster and a Reese’s Nutrageous bar (one of my favorite candy bars of all time) came about, I’d go with the Nutrageous. The ingredients are fairly similar – peanuts, caramel, Reese’s peanut butter, and milk chocolate – but the Nutrageous, ironically, is more cluster-like than the Select Clusters themselves, in that the texture is much denser and jam-packed with gooey caramel and crunchy peanuts. In all honesty, the Select Clusters are fairly similar to Peanut Butter Cups, with a few twists to separate one treat from the other. It’s a bit like deciding whether to make your peanut butter sandwich with regular peanut butter or crunchy honey nut peanut butter – there’s a textural difference, and one is slightly sweeter than the other, but either way, you’ll still end up eating a delicious, delicious peanut butter sandwich. And that’s just fine by me. As a lover of Reese’s products, I may have to seek these out and try them. any idea when these will be available in stores?